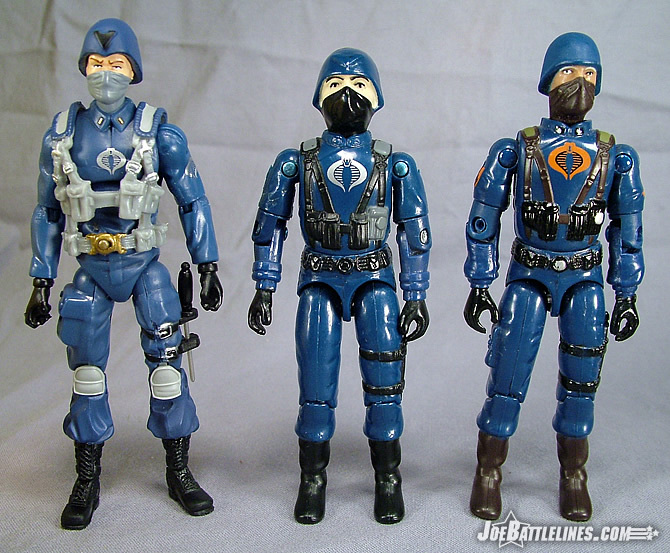 As a young Joe fan, I had a pretty pathetic Cobra army. 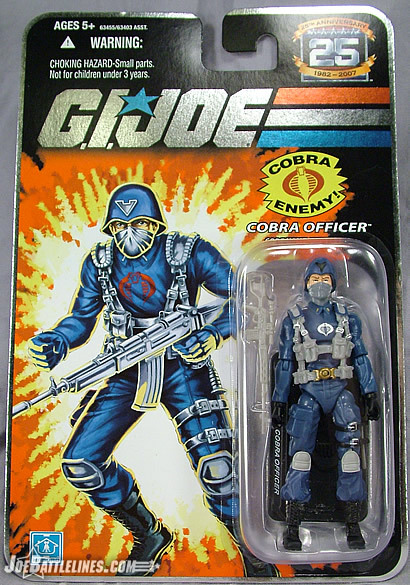 Most of the named characters were present and accounted for but the Cobra of my youth was sadly lacking in troops. I possessed one Cobra (soldier), a single BAT, and one Crimson Guard. It is this perceived “deficiency” that lead to my “army building” the Cobra Infantry Forces six packs a number of years ago, finally adding some officers to my growing number of blueshirts. 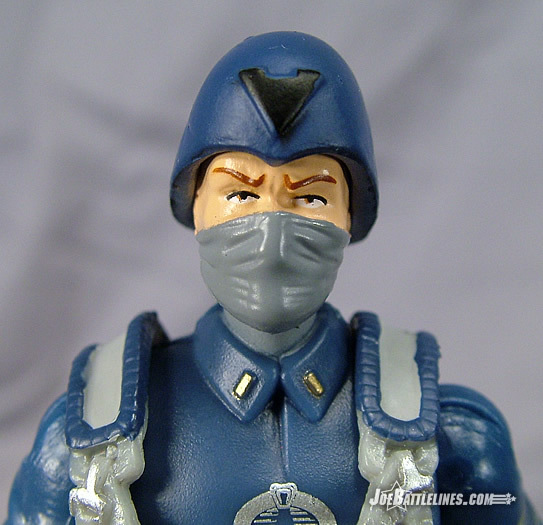 The original Cobra Officer, however, was a nice variation on the standard Cobra Trooper and it wasn’t until the past few years that I’ve gained a real appreciation for them. 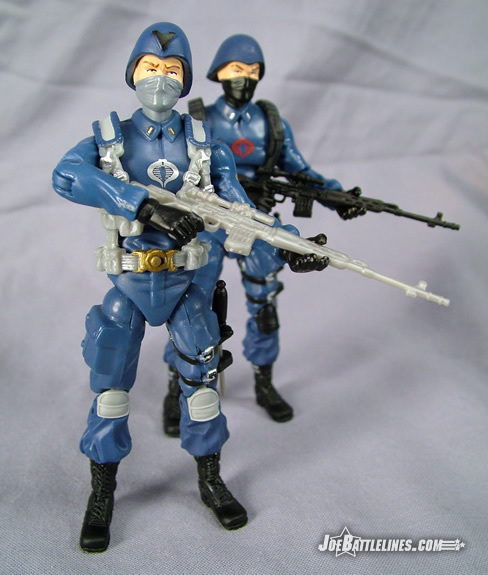 So, when Hasbro announced the release of both the Cobra Trooper and the Cobra Officer in the 25A line, I was understandably interested. Does the new Officer live up to the standard set by the original? Read on and find out! 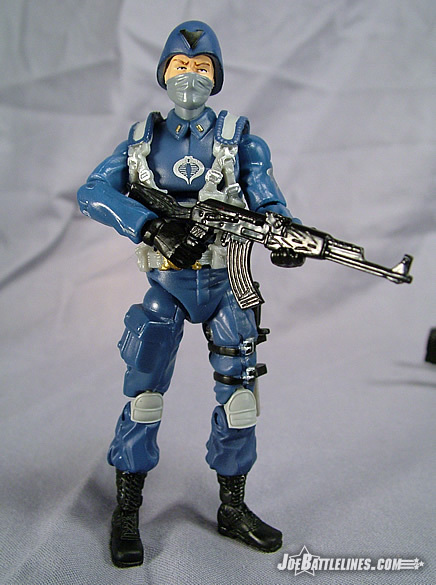 The Cobra Officer is exactly what I expect any figure of an officer to be – a modified version of the standard trooper. I’ve never understood toy lines (or franchises) that render officers in entirely different garb from the troops that they are to command. Yes, an officer should stand out from his (or her) troops, but that same officer shouldn’t also be completely isolated visually from his (or her—can’t forget the ladies) command. Literally, if you strip the harness and helmet off of the Trooper you’ve almost got the Officer. The Officer has a gray scarf over his lower jaw whereas the Trooper has the black. 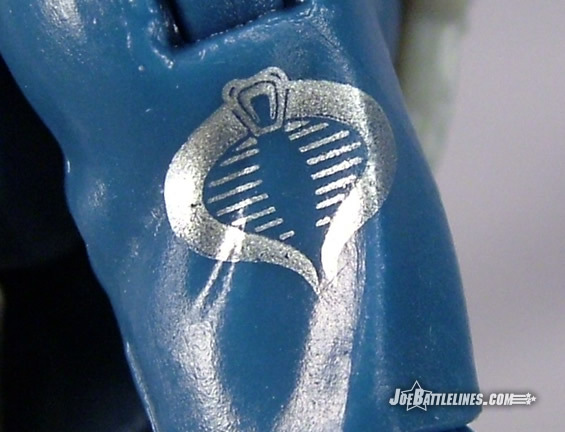 The Officer also has gold pips on his collar as opposed to silver and his Cobra sigils (arm and chest) are both rendered in silver. Lastly, the Officer’s knee pads are molded in light gray as opposed to the standard black. So, aside from some cosmetic differences, the basic body is the same—which works just fine for me. 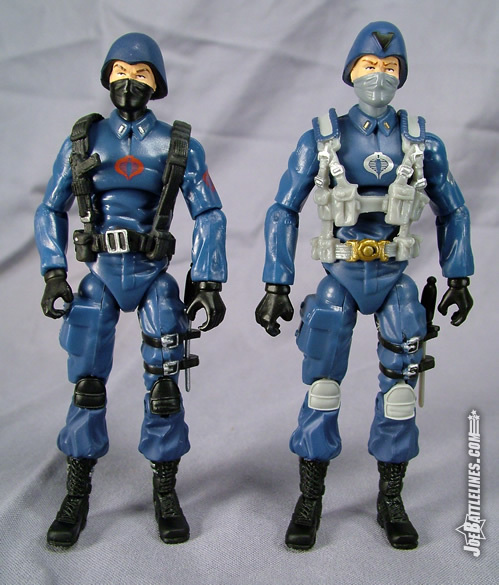 Rather than opt for sculpted web gear in the 25A line, Hasbro instead chose to utilize removable harnesses, which gives the toy maker “more mileage” out of each individual body sculpt. The Officer is no exception to this policy and I have to say that the new web gear replicates the original quite well. 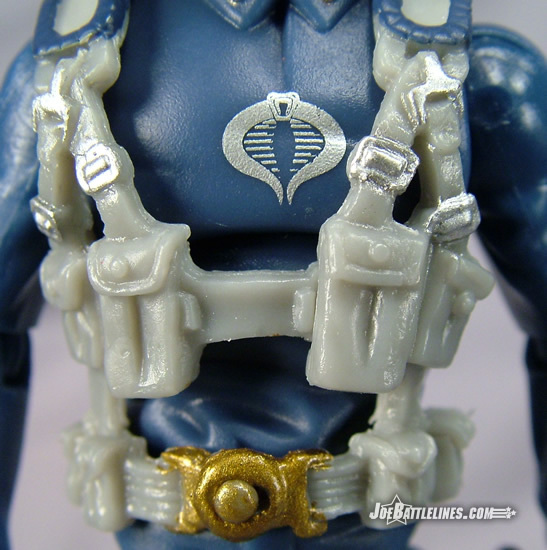 Whereas the Cobra Trooper’s harness was very simple, consisting of two “suspenders”, the Officer’s harness is a bit more involved. From the padded shoulder pieces to the dual harness and pouch system, the level of detail found in this harness is really quite impressive. There are even a few paint applications--- silver is used to highlight the buckles, blue is used for the padding at the shoulders, and gold is used to highlight the belt buckle. Like the rest of this wave, there’s no point in addressing the “articulation issues” again. 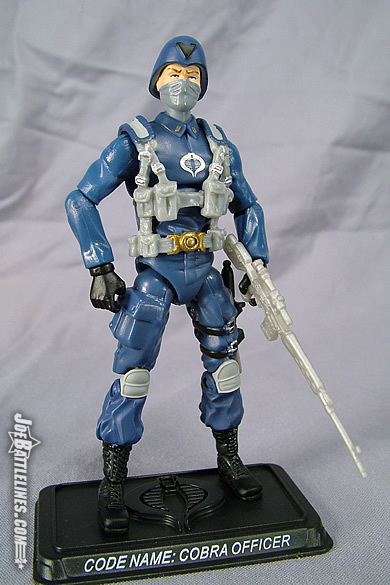 This figure is virtually identical to the Battle Pack Cobra Trooper and everything that was discussed in that review still applies. I’ve rearmed my officer with a wood stock Marauder Gun-Runners AK-47 which is much closer to the original Officer’s gear than what is included. Aside from the helmet and the new harness, there really isn’t much more to discuss. 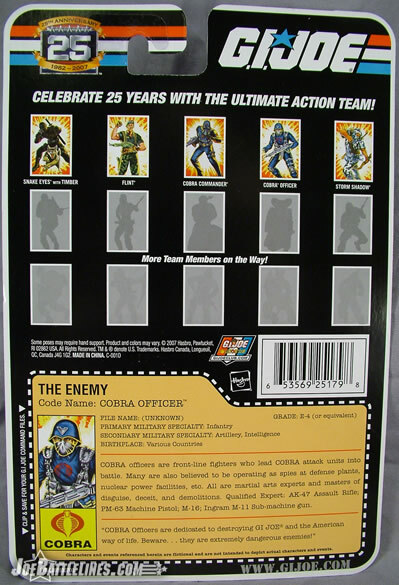 The Officer, like all of the figures in the 25 th Anniversary line, is packaged with a character specific base. His file card is found on the back of the cardboard backing. 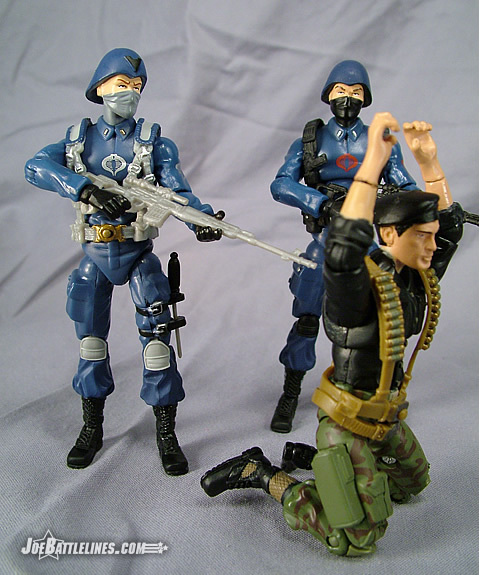 If this review seems brief in comparison to those of the other figures in the 25A line, it’s only because this figure was essentially already covered in the Cobra Trooper review. The new harness and helmet help to differentiate him from the standard troop, and the new updated color scheme is extremely evocative of the original ARAH Officer. However, there’s really not much else to say that hasn’t already been covered. I’m a bit surprised that Hasbro chose to release the Officer singly and the Trooper only in the five-packs when the reverse would have made more sense to the consumer. Still, the character design work on this figure is top-notch and, thanks to some hasty rearmament, the figure works well as homage to a figure that debuted two-and-a-half decades earlier. Fans of this line are going to army-build both the Officers and the Troopers like there is no tomorrow and I think that Hasbro is going to find that this figure is one of the better-selling pieces in the line.